Villa Alexander is one of Mykonos’ largest residential estates. It straddles an un spoilt and rocky cape between the beaches of Elia and Agrari and Super Paradise. 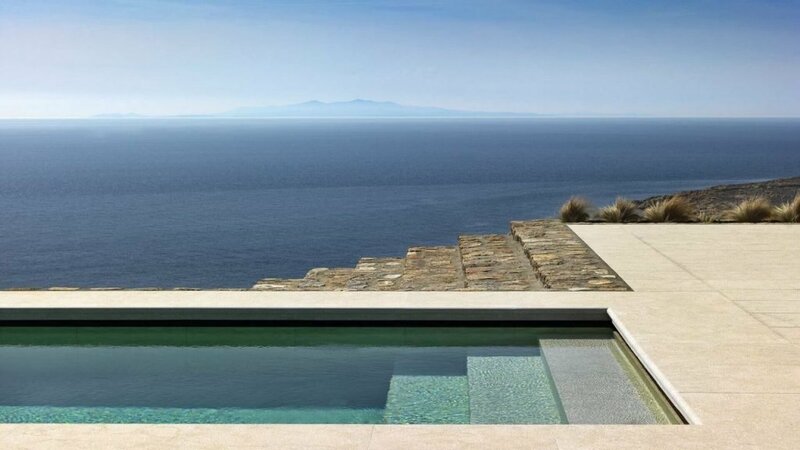 The estate affords endless views to the south, showcasing a panorama of islands: Donoussa, Naxos, Paros, Antiparos and Ios. This unique property, designed by Ed Tuttle, the designer behind the Aman brand, is the most exciting villa to sparkle on the Mykonian scene for a long time. All bedroom suites enjoy smart televisions with an entertainment system, Wi-Fi access, Nespresso machines, lap top safes, stationary supplies, in room refrigerators, full heating and air conditioning, heated towel rails, Fresh toiletries and elegant Italian sunbeds where you can enjoy the complimentary suntan products you will find in your bathroom. What makes Villa Alexander unique is the proximity and use of the Playhouse. This building of 200 m2 all on one floor, a two minute walk away, offers a state of the art home cinema, a display kitchen where breakfast is served, 2 guest WCs, a mini football table, a ping pong table and a basketball court. It is possible to host dinners for 20 inside and 10 in the outside dining pergola. Moving through the charming gardens, a few steps away is the 51-meter lap pool with incredible views, which can be heated to 36oC. There are sunbeds and a heated Jacuzzi plus an outdoor shower and marble pool bar.